Expect Orla Kiely towels, Ren products, Roberts DAB radio and a flat-screen TV. A cot bed and high chair are available on request. The large, vaulted bedroom comes complete with a king-size bed and Egyptian cotton sheets. It also has an en-suite shower room and dressing room. On the ground floor is the cosy sitting room, kitchenette (with fridge and hob) and breakfast room. Carters Yard is the perfect alternative to a boutique hotel in Cambridgeshire. 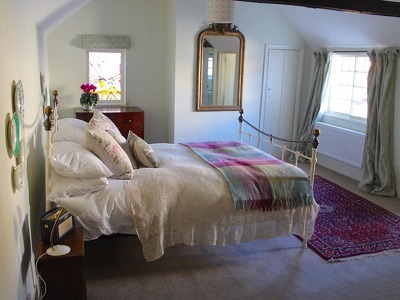 This gorgeous little self-catering B&B sleeps just 2 two people, ensuring tranquillity and privacy throughout your stay. Hidden away in the garden of a 16th-century family home, vintage charm blends with stylish, contemporary living. Within easy reach of London, this idyllic and romantic Chic Retreat is ideal for those looking to escape the stresses of daily life. Just a few minutes walk away from Carters Yard, is a cafe, deli, art gallery, chemist, beauty room and nail bar. Cambridge is less than half an hour away and is a great day out. Why not try your hand at punting, or else explore the charming streets and browse the large array independent shops. Enjoy breakfast at your leisure; a sumptuous breakfast hamper full of seasonal goodies is left outside your door for you to dig into when you wake up. In the evening, there are a couple of local pubs on Kimbolton High Street to choose from, as well as several restaurants in the nearby villages. We recommend dining at The Pheasant at Keyston, and The White Horse at Tilbrook. If coming by train, there are two stations close to Carters Yard. St Neots train station is a 20-minuteute drive (10 miles). Bedford train station is a 30-minute drive (16 miles). In the event of a no shows or early check-out, the full cost of the stay will be charged.